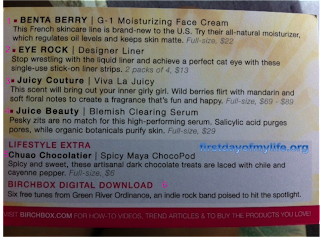 First Day of My Life: My First Birchbox! 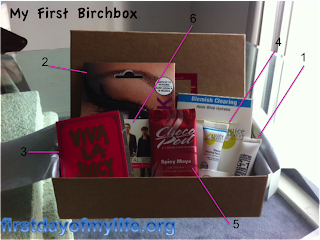 About a month ago, a Birchbox craze happened. Complete craze. I was kind of excited that it was in a box that was nice, simple (yay I can recycle the box...it's cardboard!) and the items were wrapped in some tissue paper! I really liked that it included the prices of a full-size! Very cool. Benta Berry, Moisturizing Face Cream. I was excited to get this because I am in the market for a new face cream. The last one I tried (Yes to Carrots!) was no good. Caused me to break out and didn't keep my face moisturized.) But, as far as this face cream goes - I do like it. It does seem to moisturize my face which is the whole point! Eye Rock, Designer Eye Liner. I am not a party girl. I am not a "hip chick." I will never wear this. MAYBE I will try it out for fun just to see what it will look like on me. But I'd imagine it looking pretty foolish on me. I could have done without this. Ok, so this is an organic product. Pretty cool in my book! $30 for a full bottle is pretty pricey but when you consider the fact that it is organic - can't really complain too much. I'm okay about this product. Chuao Choclatier, Spicy Maya ChocoPod. YUM. Chocolate. YAY. It is super delicious - it has a nice spicy "kick" to it...dare I say, it almost tastes healhy because of that and the fact that it's dark chocolate. But, again, $6 for full-size version. I rather enjoyed the chocolate...but not a $6/piece? don't know. I'd rather spend my funds elsewhere. So as far as the product sample goes, two thumbs up - if I'd buy the full-size, no...iffy sample. Digital Download of Green River Ordinance. I guess this is cool? It feels like I'm at Starbucks though with the free music sample. I could have done without this...I selected that I was an "active" life style so why not give me some workout music instead of indie music? Thumbs down. So, it looks like I have: two thumbs up, two thumbs down, and two "iffies." I guess at least it's all even? I will resubscribe next month to get a real "feel" for it. I mean, lets face it...these product samples are most likely given to Birchbox for free in order to get advertisement for their company. Kudos to Birchbox for the ingenius business idea! 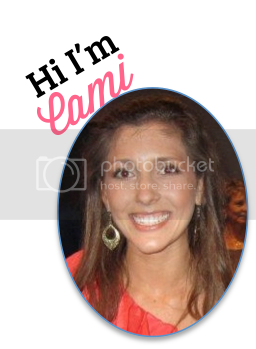 Hey Cami! 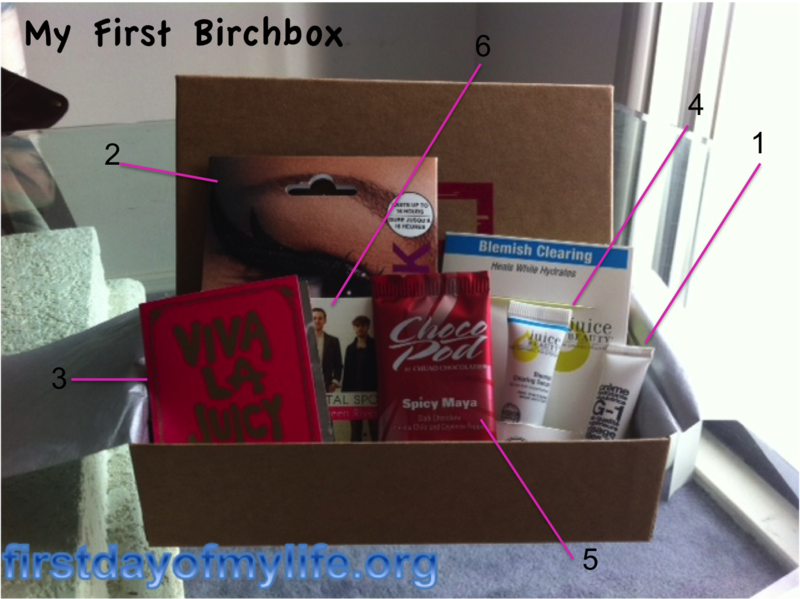 I posted today about Birchbox :) I've been with them since August, I do believe. I also get Beauty Army and you actually get to pick your samples with them and you get 6! Anyway, hope you end up liking them. Have an awesome weekend! I am totally that girl that spends $100 on juicy perfumes. I LOVE the old scent and I'm even more in love with the new one! I just haven't shelled out the money for the new one yet... it's a painful price tag! I can't wait to start getting mine!! Sounds fun! I love getting samples, so this is right up my alley. I got the juicy couture sample in my last box. The only thing we got similar this month was the song download! lol I'm with you about the pricing. There isn't much that I'd pay for the full size of. I did buy a medium size of a lip gloss I got in my first box because I REALLY like it. Viva La Juicy is one of my favorite scents! These birchbox's are a great idea, I'll have to look into it. 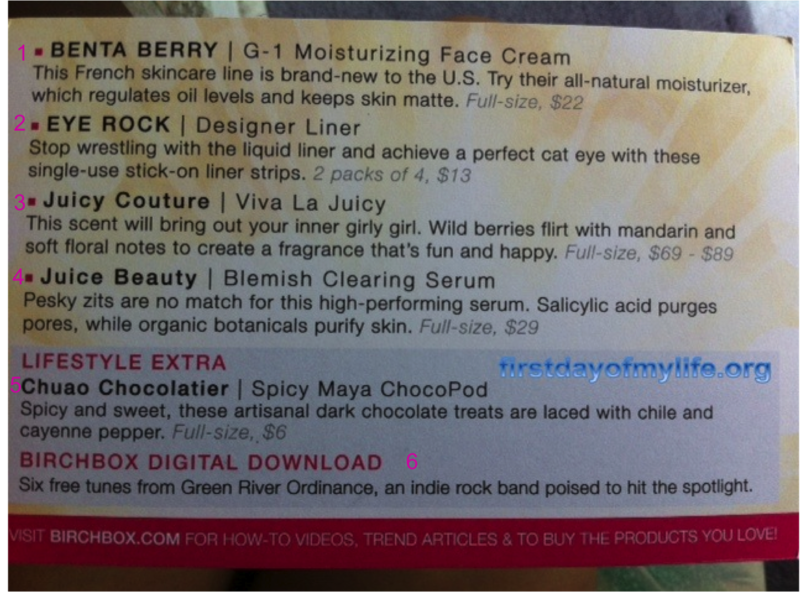 i've seen birchbox on so many blogs and i always think, mannn, i gotta try it out!! I came here through a link up. I totally agree with you about the liner! What a waste! I am not a party girl so I would have no use for them. They were fun to try on, but quickly came off because they were just too silly. Saw you on the link up. This was my first Birhbox too. I was pretty pleased. You got quite a bit of different things than what I got. I did get the liner stickers, they seem kinda fun, but I haven't actually tried them out yet. From reading other comments, it sounds like they aren't that fabulous. You got a pretty good box! I think most of us weren't in love with the eyeliner! I do think they would be fun for halloween or a themed party! Just not an every day thing! You had some pretty good stuff. I can't wait to hear what you thing of the moisturizer, I wish I would have gotten that! Thanks for linking up! Thanks for stopping by my blog! I have a love/hate relationship with Birchbox. I love the idea of it, but sometimes I hate what I get. The only box that I really loved was the January box... I actually got a Stila eye liner! I totally agree. They are ingenious! i love birchbox! you got some really cool stuff.